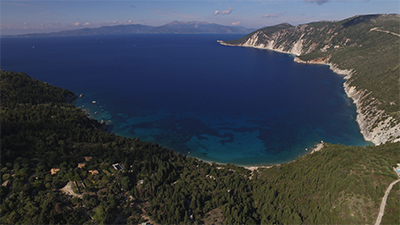 The Estate is situated above the shores of Aphales Bay on the northern tip of the Greek island of Ithaca - the island famed in history and Greek mythology as the home of the mastermind of Trojan War, Ithaca's King Odysseus (Ulysses in English). Ithaca is one of a group of seven islands which stretch down the western side of Greece's mainland, in the Ionian Sea. Of all seven, it is perhaps the most traditional, untouched by the mass tourism that airports and long sandy beaches bring to other islands. If you are looking for the fast life, then Levendis is not the place for your holiday! If you prefer to get to know the locals, immerse yourself in doing little with great satisfaction then keep reading!